The Tiger II hull was welded, with acutely sloped armour, and the well-designed Henschel turret had a separate cupola for the commander, with an excellent view. 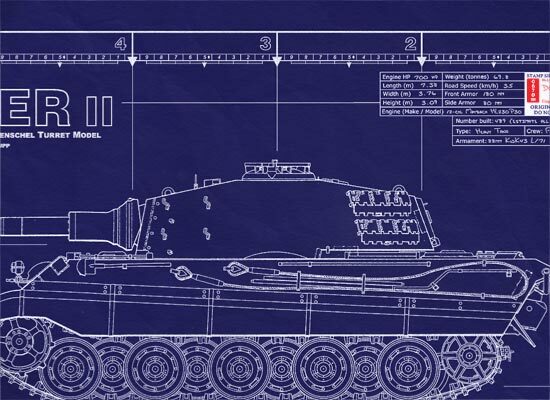 Tiger II - "King Tiger" / Henschel Turret - This is a real blueprint made directly from vellum masters. Delivered to you on a full size master sheet measuring 42"x 30". Continued from above… stock, ready for prompt delivery to you anywhere in the world. When the first 60-ton versions of the monster appeared in the final phases of the North African campaign, British and American gunners were shocked to see their 6-lb. and 75mm. shells literally bounce off the Tiger's armor plate. Only by knocking off its treads could the huge tank be stopped. The Tiger had been intended primarily for use on the Russian front and although it was successful there, its low speed and lack of maneuverability somewhat vitiated its effectiveness on the broad Russian plains. In Italy, too, the Tigers were seriously hampered by the roughness of the terrain and the lack of roads and bridges on which they could safely navigate. In Western Europe, however, operational conditions for the Tiger were good, and the tank became one of the most formidable opponents of the British and American forces driving eastward from the Normandy beachheads, although it did not appear in great numbers. By this time the Tiger had been considerably improved from its original form. In its last and best version it was known as the Tiger II or King Tiger. Somewhat resembling a scaled-up Panther, the King Tiger weighed close to 80 tons. It was armed with a high-velocity super 88mm. gun and a variety of machine guns. Its enormous treads measured 32 inches across, its turret armor was over seven inches thick and its glacis plate was six inches thick. Over-all sealing and telescopic air intakes permitted the King Tiger to ford small rivers up to sixteen feet deep. The Tiger Ausf B or Koenigstiger ( King Tiger or Royal Tiger ), also known as the Tiger II. It went into production in late 1943 and first saw service on the Eastern Front in May 1944, then was introduced on the Western Front in August 1944, following the Allied invasion of France. The Tiger II was actually a new design, owing more to the Panther than the original Tiger design. 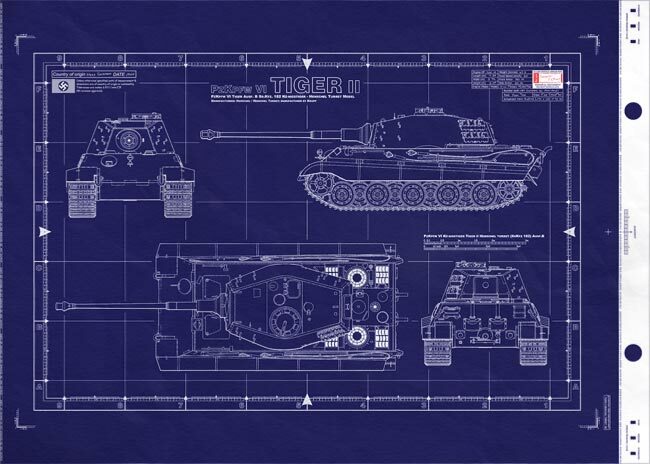 It originated in August 1942 when the Ordnance Department issued a requirement for a Tiger replacement superior to the T-34 in armour protection and firepower. Porsche and Henschel submitted designs , Porsche adapting his original unsuccessful Tiger design. His final design submission, the VK. 4502(P) was considered and a batch of turrets was put in hand. The tank itself was abandoned, however, after acceptance, for it retained the petrol-electric drive feature favored by Porsche, and copper required for the transmission parts was by this time in short supply. 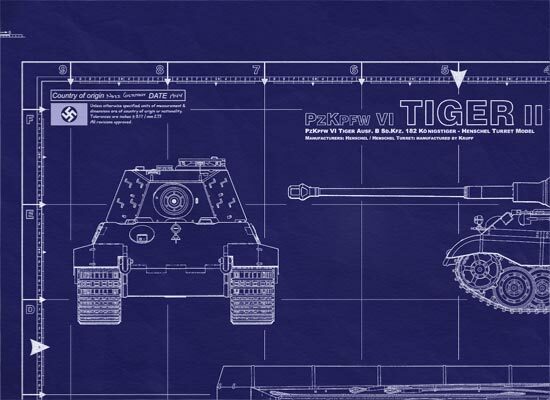 Henschel, meanwhile, submitted a design based on the original Tiger but then modified it considerably at the Ordnance Department's request to incorporate all possible features from the projected Panther II design, the objective being to aim for maximum rationalization of parts and spares. First production examples of the Henschel model were ready in February 1944, and 484 were built by the war's end. The first 50 used the more elegantly shaped Porsche turret, built for Porsche's intended design. The Henschel turret was less complicated, squared off at each end and simplified in shape as much as possible to facilitate mass production. All the good points of the Panther were incorporated, including the sloped armour. The gun was the big 8.8cm L/71, an improved longer version of the gun used in the original Tiger. Internally the vehicle followed the Panther layout almost exactly, but there was no turret basket and the vehicle was well provided with escape hatches. To facilitate loading with the heavy 8.8cm gun, 22 rounds were carried in racks at the rear of the turret ready for instant use, the noses of the rounds being close to the gun breech, requiring minimal movement for loading. Excellent vision devices were provided. The driver had a periscope in the hull roof and, in addition, could raise his seat and controls for normal 'on the march' driving with his roof hatch open. An episcope was provided for the hull machine gunner, with another in the turret roof for the loader. The gun had a monocular gun sight and the commander had a vision cupola of the type used in the late-model Panther. Radio, turret controls, and other fittings were as for the Panther. The armour protection was the thickest employed on a mass-produced tank up to that time. The glacis plate was 150mm thick, at 40 degrees, and the nose was 100mm thick, at 55 degrees. The hull and turret sides and back were 8omm thick and the top and belly plates were 42mm thick. Armour was of the interlocked type as on the Tiger. Most vehicles had a coating of Zimmerit anti-magnetic mine paste. Suspension was by torsion bars and the wheels were overlapped, rather than interleaved as on the Panther and Tiger. This simplified maintenance and wheel changing. The wheels were all steel (with rubber resilient cushions) thus saving valuable tyre rubber. Like the Tiger I there were wide and narrow tracks. The King Tiger's finest hour came in the Battle of the Bulge where it was used (with Panthers) to spearhead the 1944 Ardennes Offensive against the Americans, which almost succeeded in splitting the Allied armies. Like the Tiger before it, however, the King Tiger was so big and so heavy that it was itself a tactical liability. It presented a big target and was too heavy for most road bridges. In a straight tank versus tank shooting match it could outrange almost any Allied tank while being nearly immune itself to Allied AP rounds. But in the war of movement of 1944 where the Allies had massive resources of fast moving armoured vehicles, and mastery of the air above the battlefield, it gave the German forces at best only limited advantages. The tank's main defect still lay in its clumsiness and relative lack of speed. A 700 h.p. 12-cylinder engine, the same used in the Panther, gave the King Tiger a 17 m.p.h. top speed and left it vulnerable to certain natural tank traps. Often the Germans simply dug Tigers into shallow pits and used them as stationary pill boxes. Tiger chassis were also used to carry tank destroyer weapons. The most familiar of these, during the middle and late war years, was called "Ferdinand" by the Allies. "Ferdinand" was a 70-ton vehicle carrying an 88mm. gun housed in a large fully armored compartment atop the hull. 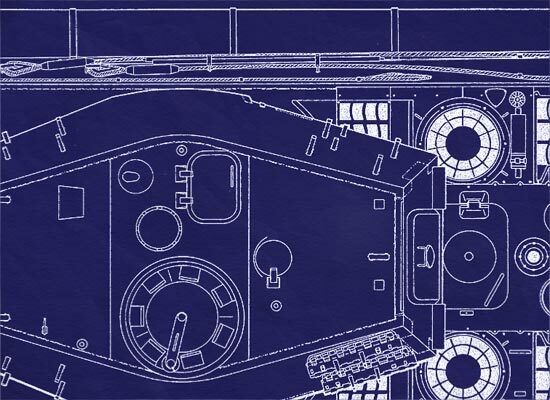 Some of "Ferdinand's" armor was as much as eight inches thick but the machine was even slower than the Tiger and was vulnerable to attack from the sides and rear. A complementary development was the Jagdtiger ( Hunting Tiger ) with slightly lengthened suspension, but otherwise similar to the Tiger Ausf B. A big fixed superstructure replaced the turret, with a 12.8 cm gun. In terms of weight, this was the biggest production vehicle to see service in the Second World War. The front plate armour was 250mm thick, sloped at 15 degrees, and made of one piece of solid cast steel. The superstructure sides were made integral with the hull sides and were 80mm thick at 25 degrees (the slope in all cases quoted being measured from the vertical). Some 38 rounds of 12.8cm ammunition were carried, and the 12.8cm gun was the largest anti-tank gun used during the war.